They say the most dangerous lie is that which contains a sliver of truth, just enough to make it sound good and appeal to our conscience while deftly leading us astray. I fear some such lies have permeated Christian culture to the point that we have turned the gospel upside down, backwards, and inside out to make it mean the opposite of what it truly is. What a coup for the enemy to use God’s own well-meaning people to pervert the greatest sacrifice this world has ever seen. What is this lie, you ask? It’s the dangerous lie that we’re good, that we’re enough, that we somehow deserve the Savior’s love. But when those who call themselves Christ-followers begin to say things like, “Jesus wouldn’t have died for you if you weren’t good enough,” when Christian leaders deny the Word of God and call sin “acceptable,” I feel a hollow in the pit of my stomach, an ache that won’t easily be ignored. It’s a lie, my friend, a dangerous lie that leads to a false gospel, one meant to keep you enslaved rather than freeing you to be the child of God you were created to be. The Bible is clear that we are all sinners and deserve death (Rom. 3:23, Rom. 6:23, Rom. 3:10-12, 1 Jn. 1:8-10). This false idea that we can be good enough on our own is as old as the Garden of Eden when Adam and Even attempted to cover their shame after their disobedience. You see, when Adam and Eve disobeyed and their eyes were opened to their own sin, they immediately felt the shame of being not good enough. They recognized their offense to a holy and righteous God, even as they busied themselves trying to cover it up. It’s our natural tendency to downplay our sin and exaggerate whatever good we can find in ourselves. It’s our natural tendency precisely because we are imperfect beings in need of a Savior, imperfect beings who wish with our whole hearts to be good, to be special, to be loved. The irony is that we were created for exactly that kind of relationship – to love and be loved, to walk in communion with our Father God. So when we walk away from Him and from His ways, we find ourselves an empty, needy, downright desperate people who are stubbornly determined to prove our worth, our rightness. You and I see and hear examples of this every day, especially in these politically and morally tumultuous times. Every one wants to be right, right? The danger that lies in calling ourselves “good enough” is twofold: it either tempts us to deny our need for a Savior in the first place, or for those who see so clearly their own imperfections, it tempts us to embrace a works-oriented salvation by wasting this one life we have trying to “earn” a status that is freely offered. If the lie is true and we are so good that Jesus died for us, then why would we need His death? Why would we need Him at all? Thus the dangerous lie inverts the gospel, turns it topsy-turvy until we begin to believe that we must somehow save ourselves. And that’s exactly what the enemy wants us to believe, my friends. He certainly doesn’t want us to acknowledge Jesus as our Rescuer and Redeemer. He certainly doesn’t want us to experience the power of a gospel that is both redemptive and transformative in our lives. Instead, the enemy would love to keep us focused on…well…us. Listen closely, friend, the heart-stopping beauty of the gospel is that we. are. not. enough. We are helpless sinners who offend the holiness of our Almighty God. Yes, that is who we are at our core apart from Christ, but praise God, it doesn’t stop there. What’s so beautiful about such a horrifying death? It’s beautiful because He sacrificed for all of us, for the worst version of us, for the hidden parts that we don’t dare show to another human being because we can barely admit to ourselves the ugliness of what lies within us. He died even for the worst of humanity – the kind of people who do things that make us sick to our stomachs. Yes, He died for them, too. 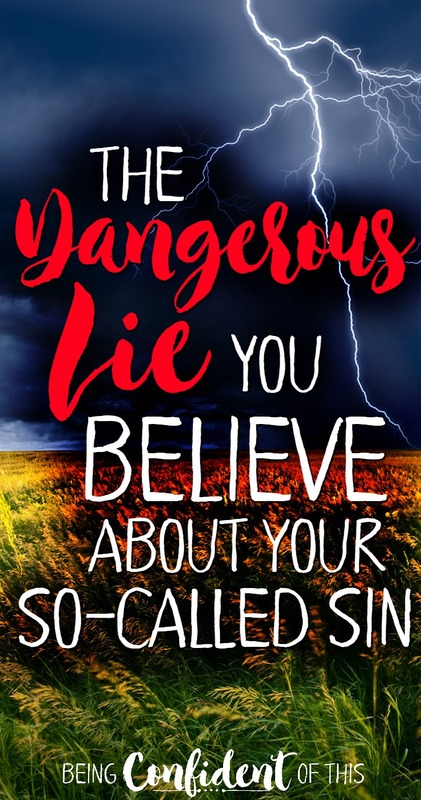 The dangerous lie about your so-called sin doesn’t lead you or others to salvation, friend. It leads you to more of the same-old, same-old – trying to cover up the darkeness within that we don’t want anyone else to see, that we won’t even admit to ourselves. Even we who are already in Christ fall for the dangerous lie from time to time. We fall for the lie when we tell ourselves this one little sin won’t hurt. We fall for the lie when we abuse grace. We fall for the lie when we choose the world’s wisdom over God’s Holy Word. We fall for the lie when we tell ourselves we have to earn His approval. I’m tired of falling for this dangerous lie, and seeing others fall for it, too. How about you? Let’s start telling the whole truth instead. Let’s tell how great the love of Jesus is, but let’s not leave out how sinful we are. If we leave out our sin, we deny the full power of the gospel. After all, how can one save someone who doesn’t need saving? Let’s remind each other of our position in Christ – fully loved, fully accepted, always cherished, continually pursued – but let’s make it clear that these labels are for those who have actually accepted Christ. Otherwise, we unintentionally teach others to believe what is not yet true for them. Let’s stop teaching others to be confident in themselves and teach them to be confident in Christ instead. Let’s not be afraid to admit the depth of our own sin because when we do, we’ll fall even more in love with the Savior who chose us first, who died for us even when we despised Him and His ways. Let’s be willing to count ourselves a needy and desperate people, hungry for a righteousness that comes from God alone and not ourselves (Eph. 2:8-9). Let’s quit telling dangerous lies about our so-called sin.